Kings of the Mountain: Evacuation! Well, the last 24 hours have been interesting. 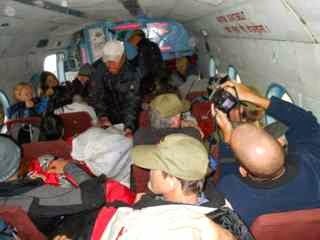 Due to significant cloud cover very few flights were able to land in Lukla and consequently very few flights were going to leave Lukla and return to Kathmandu. We had a decision to make. 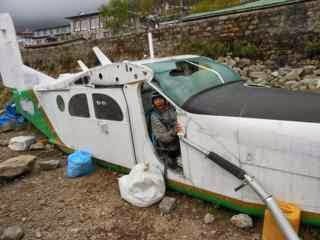 It was possible that we may miss our connecting flights departing the country. 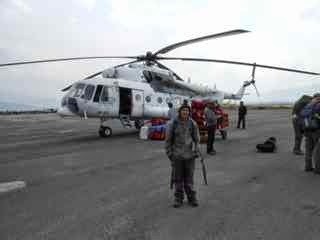 So we did what any sane person in Kathmandu would do - we contracted a large Russian helicopter to transport us off the mountain. We were all packed in there- with luggage in the aisles. It was actually quite funny. We had to wear ear plugs because the noise was so loud. But we made it! Another wonderful adventure. We are now safely in Kathmandu and are departing tomorrow. We will fly for almost 24 hours (not including stop overs) to get home. - Just counting the times we went up, our elevation gain over the trip was 38, 574 feet! Quite an accomplishment! Both Aadam and I had a great time. How fantastic Aly and Aadam, what an incredible adventure for you both. Yoga will be great after all of your hiking, congratulations on your achievements!